The Fireflinger Groink is an enemy found in Hey! Pikmin. It's a fish-like organism with some robotic parts, and is about three times as large as Olimar. It looks very similar to the Gatling Groink, although it is red with yellow stripes and has less robotic elements, and has glass on its front robotic legs. 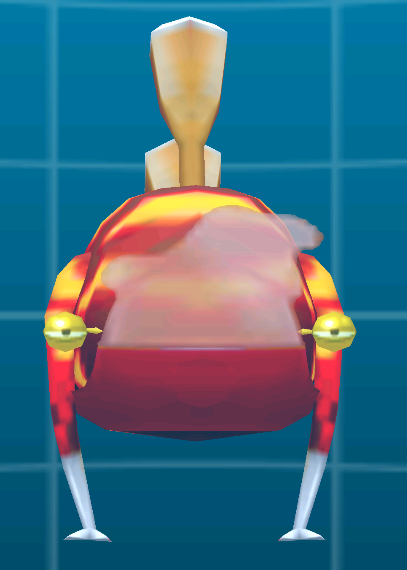 It repeatedly spits large fireballs from the background by extending a mouth-like turret, and when a fireball hits, it can kill Pikmin and damage Olimar. It is fairly rare, only appearing in two areas. To do: Find out if this enemy has any seed, health, or regen values by looking into the game's code. The Fireflinger Groink sits in a stationary position in the background of the level, and cannot be interacted with. Once it spots Pikmin, it will fire large fireballs at the foreground, raining down these projectiles onto the level. They will continue to attack relentlessly until the player goes far enough away from their firing spot. The Fireflinger Groink sits in the background of the levels it is encountered in, and as such, cannot be attacked. The player can anticipate the spots where their fireballs will land by the preceding beam of light. The best thing to do is to walk forward right after the fireball drops, since it will take a little bit for the next one to reach. The Fireflinger Groink introduction cutscene. Notice the beam of light that appears right before the fireball lands. A Fireflinger Groink behind a trowel in The Burning Sky. Fireflinger Groinks in the beginning of Burning Bog. The Fireflinger Groink shares many similarities to the Gattling Groink, which is interesting since both creatures do not belong to any known family. In the Hey! Pikmin logs screen, the size reference is incorrect. The creature is shown to be the size that it is drawn on-screen in-game, but because in-game it is far away, its real size should be much larger. This page was last edited on March 2, 2019, at 09:42.